Could Your Home Be a Fire Hazard? Could Your Home Contain Lightweight Wood? It's been discovered that lightweight manufactured wood has been used in three major Massachusetts construction projects that have recently caught fire, area residents are now wondering if their homes may also contain the wood. The lightweight engineered wood used in large apartment and commercial buildings also appears in single family homes, builders said. 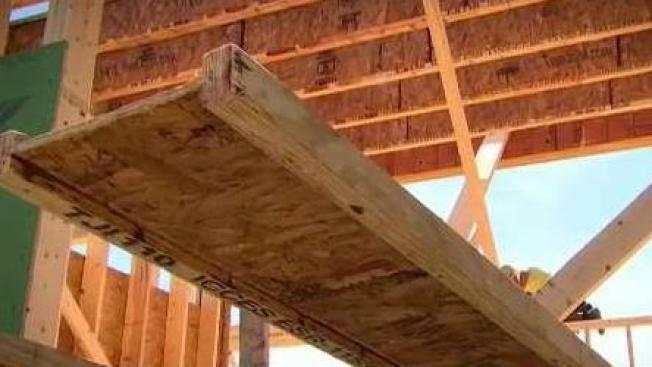 I-beams — a piece of plywood between two wood pieces — are used as floor joists. In a fire, the plywood section can burn faster, leading to a faster support failure, according to several tests and studies. Traditional dimensional lumber lasts as much as three times longer. But builders and manufacturers have said fire protection in homes, like fire-rated drywall and smoke and carbon monoxide detectors, get residents out of a home long before the structure begins to burn. David Doddridge is the building and construction forensic expert who conducted one of the fire tests. Doddridge said the manufactured wood is not a bad product, but is vulnerable to failure faster. “The manufactured produced failed considerably quicker than the traditional lumber did. Approximately three to four minutes faster,” he said. Builders and local elected officials want developers to keep building costs down, an attempt to alleviate the high cost of housing in Massachusetts. One way to keep costs down in larger apartment buildings is to use lightweight engineered wood instead of steel and concrete. It is also used in single family homes to allow for bigger rooms and higher ceilings. Most people can see if they have the wood in their homes by finding exposed floor supports. “The easiest way to do it is go down to your basement and look up,” he said. If you do have it in your home you can have fire resistant products sprayed on it. Homeowners also can shield the wood with fire-rated drywall. Some states require a fire resistance coating to be factory applied to lightweight engineered lumber in parts of buildings where it is exposed, like in a basement. The code has been in effect for only the last couple of years, so hundreds of thousands of homes are without the fire resistance coating applied. The big concern in a home is when this fails, you can walk on a piece of carpet on the floor and the only thing holding you from falling through is that piece of carpet. It has happened to firefighters and some have died as they fall from the top floor down to the basement of homes. Two fires in the last month has renewed scrutiny on the material. Lightweight engineered lumber was used in a large incomplete residential complex in Waltham that burned to the ground Sunday. Last month, Boston firefighters battling a blaze on the top floors of an unoccupied residential building in the Ashmont section of Dorchester were ordered off the roof as fire ate through the engineered joists and beams. The machinery on the roof began falling through. Two firefighers were injured in Waltham on Sunday. No one was reported injured in Dorchester on June 28.